The first thing I do in the morning, when I come to the office, is to check Dr. Google about the news regarding air pollution, especially in India. Believe me, there is always something new. Air pollution is on the news as it’s coming into our lungs, but apparently it doesn’t make the Indian government ashamed of what they are (not) doing regarding the issue. For those that actually read the news – which I believe is a small percentage of the bunch of people living in this country – it’s all about finding a way to protect themselves. “Which brand of air masks is the best? Which air purifier should I buy for my house?” From what I see, only a few people are looking for a solution or changing their daily habits that contribute to the issue. After one year of living in India, I finally realized that people in general are not worried because they don’t know how big the problem is. Most of them never went abroad and never breathed clean air once in their lives. The other day I had to explain to a friend how bad the lack of sanitation in India; that having a lot of trash in the streets is not healthy at all and the big amount of animals like rats, pigeons and crows on the streets are signs of a filthy environment. 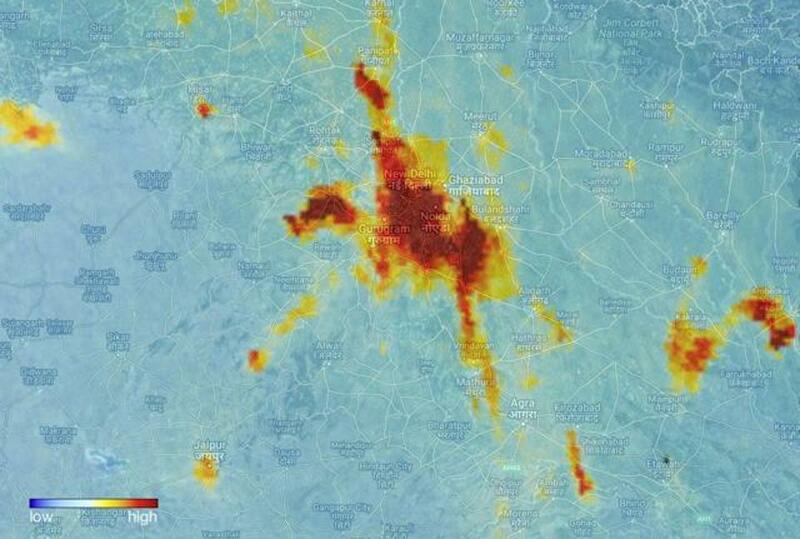 New Delhi’s air pollution captured by Copernicus Sentinel-5P mission on November 10, 2017. Available at: https://goo.gl/LyKQwv. For someone like me, coming from a non polluted city in Brazil, the shock is huge. Imagine for expats and tourists coming from other places that don’t face issues with pollution at all. Even if they do, most of them are not as serious as in India. Just check any map regarding air quality worldwide, or the pictures released by the European Space Agency’s (ESA), captured by the Copernicus Sentinel-5P mission on November 10. They say that one picture speaks more than a thousand words, right? Wrong: most of the times, air pollution is not even visible. Every year in Delhi it is the same old story: winter comes and people start to freak out. However, the levels of air pollution were bad in the summer and spring as well. They were just not visible. 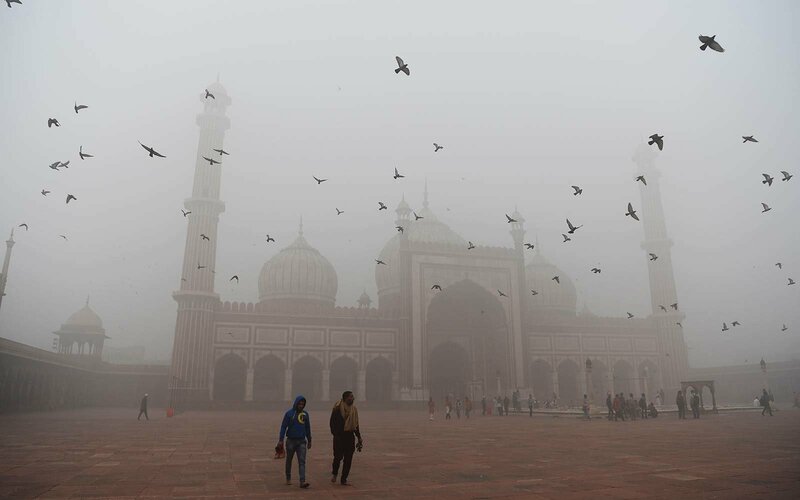 As we know, the temperature drops and increases the pollution, leading to the (in)famous Delhi Smog, but it doesn’t mean that the air was decent the rest of the year. According to the World Health Organization (WHO), India has the world’s highest mortality rate from respiratory disease. Air pollution in India is ten times the WHO’s recommended maximum, twelve times the standards employed in the United States, and over twice the level considered acceptable by the Indian government. In 2015, there were 25 lakh premature deaths due to air pollution, and the numbers will keep increasing if we do not take action to curb the problem. There are many studies that show the effects of air pollution. The most recent one, released by the medical British journal Lancet, concluded that pollution is the largest environmental cause of disease and premature death in the world today. In India, air pollution is the second biggest health risk across the country, after child malnutrition – which is related to air pollution as well. Both issues were also the main causes of death in Delhi’s National Capital Region last year, according to the report. What surprises me is that despite all the work, reports and research that has been done regarding air pollution sources and its effects on children and human health, almost no action has been taken – just a thousand promises and plans that never went on. In the meanwhile, cosmetic brands keep launching and advertising their anti-pollution products, like shampoos, face wash, face masks, etc. According to the Mintel’s report, over a third of all anti-pollution beauty products were launched in Asia Pacific in 2016. It’s bizarre, but makes sense. I dare you into an auto-rickshaw ride in the peak hours around Delhi: even before reaching at the destination, you’re gonna realize a thick layer of ‘sand’ clogging your facial pores. Ironically, some of these products – and most devices used for air and water purification – are made out of activated charcoal, that usually is derived from coal, one of the biggest sources of energy – and pollution – in India. Which means that we are washing out the pollution from our faces at the expense of the social, health and economic effects of coal exploitation. We wouldn’t have to do it in the first place if the government commits itself to invest in sustainable and renewable energy sources. And that’s what Greenpeace India has been trying to do over the past few years. According to the organization, “in 2015 the Environmental Ministry setted new standards for emissions that made it mandatory for coal power plants to reduce their toxic emissions. The deadline to comply is 7th Dec 2017 but many of these power plants are ignoring the standards and continue to poison the air we breathe”. They setted up a petition to push the Environmental Minister, Dr. Harsh Vardhan, to take immediate steps to implement the standards. After reading a few headlines and coming to know that the Ministry of Home Affairs cancelled Greenpeace’s registration in India, making them fighting seven cases in court for its survival, it became clear for me that India’s problem regarding the air quality relies much more in corruption and high-level lobbying than anything else. More than ever, people in India need to be aware about the air they breathe. Clearing our minds is the only way out to clear our sights – and our lungs.